It always seems so strange to be heading back to school in August. I LOVE summer, and I try to enjoy every last drop of it. But there is something really fun and exciting about getting ready for a new school year. I try to balance my (and my kids') excitement for getting new school supplies with a thoughtful approach where we consider what we'll really need and use. For art supplies, I stick to the basics and get a few new exotic things to add a little intrigue. We've tried lots of different things, and I have some fun tips to think about as you head out to gather your supplies for the year! I've compiled a list of the essentials, and added a few fun extras you can try if you're feeling adventurous. You can sign up here to get an email link to the checklist! If you've ever taken art classes, you'll probably know that there is a WIDE range of quality in the materials you can buy. While it may not be practical to head to the art store and buy everything top of the line, I do think it's wise to invest in high caliber materials when you can. There's nothing wrong with starting off buying most things at Target... crayola and other kids brands are great... and you can make a lot of amazing art with them. But if you are at a place in your homeschool where art is a priority, it's good to start upgrading your materials. Kids can tell (just like anyone else) when they are using "the good stuff" and many times their effort and attention to their work is elevated to match the nicer look and feel of their art supplies. When you're ready to take things up a notch, use these little tips and strategies. It's easier than you think to build a great art area for your kids! Get the Michael's app, and go often. They almost always offer 40% off one regular item, and they have a large selection of nice art supplies. Look for things like colored pencil sets, watercolor sets, or multi-packs of canvas board. Visit your local art store, and get on their mailing list. They will send out coupons and sale emails that you can use to stock up on your favorites, or try something new. It's also fun to just wander around the art store from time to time. They usually have samples of watercolor pencils, oil pastels, and other supplies you can try out. It's amazing how everyone has their favorite brand, and sometimes even professional artists don't agree on which brand is the best. Art supplies are a personal preference, so it's nice to try them out before you buy them and make sure they will work for your kids. Look online. Some online retailers sell professional grade art supplies for way less than you can find them in the store. I'm in no way affiliated with them, but I love (and recommend) dickblick.com for great art supplies. You can even read reviews about the products to see what other artists thought. Think about what your your kids love to use most, and upgrade that first. If they paint, invest in high quality brushes (which make such a HUGE difference), or some nice paints. If they prefer to draw, get a set of amazing drawing pencils for them to hone their skills. Think about how your kids do art. Do they draw on the floor, paint on an easel, or take their nature journal outside and create art there? Depending on where they make most of their art, you can start by making that a better experience for them. Do they need a travel paint set? Containers to organize supplies and end frustration? A comfortable stool to use that is just the right size for their easel? Taylor their space to meet their needs. Think outside the box. You don't always need things from the art store. I love using ice cube trays as paint palettes, recycled containers to hold pencils and brushes, and a silverware organizer to stash paint tubes, crayons, and markers! Get creative with your storage and organization so you'll have more money to spend on actual supplies. [Common Sense Caution] Whenever you invite your kids to create art using "real" art supplies, please be aware that they may not be washable. Always read the instructions and warnings on any new product before giving it to your child, and be careful when purchasing markers – some have strong fumes, and shouldn't be used by little artists. I hope you're excited to freshen up your kids art areas, and have some fun exploring new materials this year. 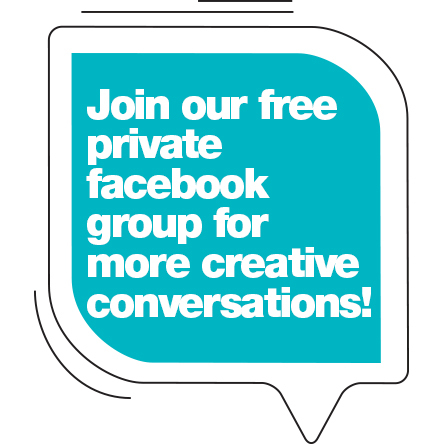 Come join our fun (and free) facebook group to chat with other homeschool moms, and ask me anything about art supplies! Sign up to get your checklist! Sign up with your email address to receive news and updates... and the art supply checklist you can use to plan your kids' dream art area!